Format: bilingual DVD, 5 eps., 125 min. Comments: Otaru's search ends... or does it? 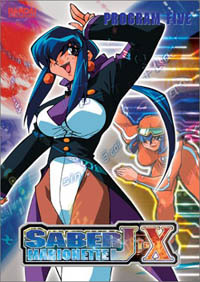 Saber Marionette: J to X tells the continuing story of the three Marionettes with souls - Lime, Cherry, and Bloodberry. With their master, Otaru, they have left their home nation of Japoness for a much needed vacation in Xian - hence the J to X subtitle for the show. In the last volume, Otaru fell ill, and when he awoke, the three girls were gone. He's spent the last few episodes trying to get back into contact with the Marionettes, but when he finds them, they no longer seem to recognize him. After spending weeks with a group of criminals, Bloodberry runs into the circus she visited in Japoness before she lost her memory. Eventually, fate brings the girls and Otaru back together, but with their newfound lives, things become more complicated than expected. Will Lime be able to give up her job as a nurse? Will Bloodberry leave her friends at the circus? And how could Cherry abandon the children she's been caring for in the monastery? As usual, there's enough drama in this show to keep the emotions going up and down as viewers follow the Marionettes' lives. The "Ghost in the Shell" theme has been around before the manga or anime. Practically since the beginning of science fiction, we've been fascinated about sentient robots and their potential for the immeasurable spark we call a soul. This idea has indeed been explored before, but Saber Marionette has always done it well. The characters are unique individuals and I find it easy to care for them, even if they are nothing more than a series of quickly changing images on a DVD. This series isn't all tears, however. While the tension is building as the show reaches its climax, there are still light moments of necessary humor to balance out the darker events. The animation for this recently-produced show is smooth and the colors are vivid. While this is a science fiction tale, the background is bright enough to be appropriate for a fantasy, especially in the China-influenced empire of Xian. Character designs differ a bit from previous Saber Marionette series. Everything is a bit more angular than before, but it doesn't bother me in any way. CG is used, but it's never obtrusive. It's most commonly used for weather effects or for combining layers of animation. The music is catchy, and the themes for the credits are particularly good. I've always been a fan of Megumi Hayashibara, however, so it's not surprising I like the songs in the show, since she performs them (as well as the voice of Lime on the Japanese dub). The voice acting in Japanese is good, for the actors are able to carry an emotionally charged show without allowing it to get too mushy. The English dub is better than average, but some actors -- especially for characters in the circus -- sound just plain odd. There is the occasional awkward pause, but I blame word fitting software more than directors or performers for that annoying trait. Extras include three small segments on the making of Saber Marionette, but they're extremely short and can't be considered true features--they're just a nice little bonus. There are three trailers on the disc, as well. A good art collection would be appreciated here, or perhaps some cross-marketing promotions with TOKYOPOP now that they're bringing the manga over to North America, but I suppose that's nothing more than wishful thinking, for now. I first got into the Saber Marionette universe with the second volume of this series, and I enjoyed it enough to buy everything that came before it. While J to X started out a little on the fluffy side, the story is engrossing now that we're getting near the end. Luckily, there's more of this on the way. This is a fun show with likeable characters that attempts to tackle one of the oldest questions in science fiction -- do Marionettes dream of electric sheep?